On the right is Frans Brüggen who progressed from recorder and baroque flute virtuoso to distinguished early music conductor and co-founder of the Orchestra of the 18th Century. 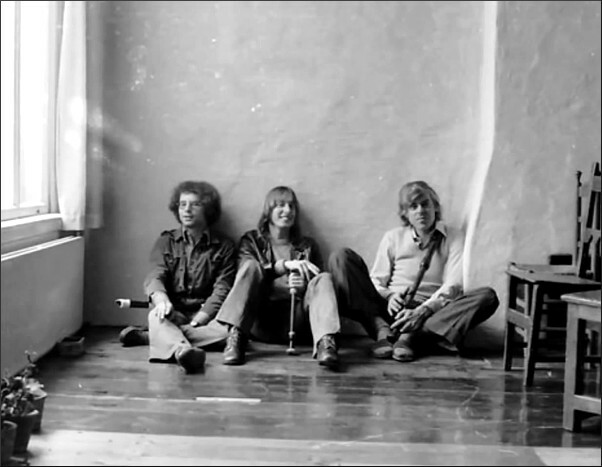 The photo dates from the early days of the avant-garde recorder trio Sour Cream co-founded by Brüggen in 1972 which was involved with the Dutch counterculture movement. The other founder members of the trio Kees Boeke and Walter van Hauwe are also in the photo. It was remiss of me not to include in my recent Music for Meditation post Sour Cream's legendary The Passion of Reason which was recorded when the trio reformed in 1993. The album is sub-titled 'Five Centuries of 'scientific' music' and arranges music from Guillaume de Machaut to J.S. Bach. It is influenced by the concept of the mediaeval quadrivium or the convergence of music, arithmetic, astronomy and geometry, and inhabits the speculative world of Hermetic philosophy and alchemy. Initially released on the Attacca label by Sieuwert Verster (co-founder of the Orchestra of the Eighteenth Century), The Passion of Reason was reissued by Glossa in 1997 as a double CD. An audio sample of Sour Cream's interpretation of Christopher Tye's 'Sit Fast' can be heard via this link. The important thing is to discover the extent to which the rhythms of the so-called traditional mode of thinking merge with the movements of contemporary thinking. At their present farthest limits physics, biology, mathematics touch on certain traditional concepts: certain aspects of esoterism, visions of the Cosmos, of the relation between energy and matter. Modern science, once freed from conformism, is seen to have ideas to exchange with the magicians, alchemists, and wonder-workers of antiquity. A revolution is taking place before our eyes-the unexpected remarriage of reason, at the summit of its victories, and intuition. For the really attentive observer the problems facing contemporary intelligence are no longer problems of progress. The concept of progress has been dead for some years now. Today it is a question of a change of state, of a transmutation. From this point of view those concerned with the domain of the interior life and its realities are in step with the pioneering savants who are preparing the birth of a world that will have nothing in common with our present world of laborious transition in which we have to live for just a little while longer.